Today, was all about friends. Sure, Our Washington Nationals and Baltimore Orioles showed up at RFK Stadium this afternoon to play a meaningless exhibition. And, as usual, The African Queen and I attended. But, baseball was just the backdrop. We spent nearly the entire time, before, during and after the game--catching up with all our good friends. This Group Of Dedicated Nationals Fans that have thoroughly given their support to our team and joined in on ALL THE FUN OF SECTION 320. As Sohna and I entered the stadium today at Gate B, we immediately met Section 320 Regulars, Julie & Troy. Troy laughing at us asking: "You guys need any tickets, by chance?" Smiles, Handshakes & Hugs All Around. Then, as we rounded the lower bowl behind home plate, our Good Friend, Colleen came running up to greet us. Shortly followed by her husband, Jeff. Their Rally Monkey "Curly W" was holding down their seats behind the Nats On Deck Circle. We caught up for some time. Later, one of our favorite ushers, Richard, reached out to squeeze The Queen, and strongly shake hands with me. Pleased to see us. Richard telling us he was set to retire, but he didn't want to leave us for the last season at RFK Stadium. Turning around, I found myself hugging Iris, and her husband, Biff. Iris saying to me: "You have been a very busy man this off season." I laughed--Yes. We chatted for some time. As the African Queen talked to many of our friends in Section 320, I found myself being thanked by many readers of The Nats320 Blog behind the Nationals 3rd Base Dugout. I don't remember all your names, but thank you so very much for your kind words. I very much appreciate this support. When I returned to my seat for the start of the game, The Queen informed me others had stopped by to say hello. I am sorry I was not there, but please stop by at a later date and introduce yourself. Brandon, from The Curly W, also stopped by during the game. It was GREAT TO SEE HIM! Despite a very modest turnout (officially--14,940), the crowd was in good spirits. And, when "THE GUZ" singled in his first at bat during the bottom of the first inning, he was greeted with a standing ovation from the Nats Faithful. Could this be "The New Guz"? We can only hope. Unfortunately, Cristian Guzman reminded everyone of his 2005 play in the top of the 5th when, with two outs, he fielded a routine two hopper to short and half armed it in the dirt to Larry Broadway at first. RallyTimeRichard and I calling it all the way. Both of us saying before Number 15 let loose of the ball-"Here it comes!" Sure enough, the ball skipped along the dirt, a good foot in front of the stretching Broadway. Nats Fans, reliving a bad memory from two years back, let Guzman know. Those were not "Guz" being exclaimed by the faithful. Except for Baltimore's Corey Patterson absolutely blasting a Home Run over the CenterField Wall off Nationals Starter Jason Bergmann, the remainder of the baseball game was uneventful. Mr & Mrs. MickNats, RallyTimeRichard, BangTheDrumNatly, Julie & Troy along with The African Queen and myself represented Section 320. Although not in Mid-Season Form, we were Bellowing, Cheering, Chanting & Singing throughout the nearly three hour affair. And, of course, SCREEEEECH!! came by, at customary first pitch, to take in ALL THE LOVE!! Smooch The Queen--and, of course get--"DOWN IN FRONT!!!" Down in Front cracks everybody up. Screech hoping along on all fours to not block the view of Section 320, absolutely hilarious. MY BEST FRIEND is a good sport. Late in the game when the "What Time Is it??" --"Rally TIME!!" --Chant was yelled out, the puzzled looks from those still in the crowd over the meaningless game at us--priceless. Then, a child sitting in The Washington Nationals Dream Foundation MVP Field Trip group in Section 321 screamed out "What Time Is It!!" And was immediately responded to by EVERYONE in Section 320--"RALLY TIIIIIME!!" A great cheer erupted from the 350 Kids on the MVP Field Trip. We were happy to help make their day even more enjoyable. This Exhibition Game became Official early, when MickNats took his customary seat. Immediately followed by the INSTANT ARRIVAL of Neal with The First 2007 BEER! Pleasantries were exchanged, Season's Greetings and The Official "First Pour". But, a CRISIS SOON DEVELOPED. No longer are BEER BOTTLES served by vendors in the stands. Only smaller pop open cans now. Apparently an order from Management concerned over the amount of plastic trash thrown on RFK Stadiums floor during each and every game. Maybe even a safety hazard as the rolling bottles could cause someone to slip. Neal handed MickNats his beer, IN A PLASTIC CUP!! Groans followed. Immediately, RallyTimeRichard and The African Queen and Mary hunkered down into crisis mode. "How are we going to make all that noise with The Budweiser Bottles, if none are available?" RallyTime & Sohna decided they would have to test the waters, so to speak--by bringing into RFK various spring and purified water bottles, over the next week, to see which provided the most robust sound. This conversation went on for an entire inning. Fortunately, The First Section 320 Crisis was avoided when, while RallyTimeRichard and BangTheDrumNatly went out to the concourse, they noticed anyone can buy a BOTTLED BUDWEISER there, and return it to your seat. Smiles and High Fives all around. And, let me tell you, RallyTime and The African Queen let loose late in today's ballgame. The entire crowd along the third base side turned to look in amazement. There was no President's Race, but "The Rushmores" did make a token appearance during the 4th inning hanging around the lower bowl. The Loveable Loser--Teddy Roosevelt, posted up in Section 320. You can bet, Screech'sBestFriend stopped him for a picture. But, today's truly fun entertainment was provided by The ZooperStars. Various sized plastic, rubber, blow up creatures with fictitious names of well know sports celebrities. Personally, I had never heard or seen them previously. Troy telling me they are standards at many minor league parks around the country. The ZooperStars odd sizes mixed with standard movements was quite funny. Their flexibility terrific and the source of much laughter. Mary (Mrs. MickNats) happened to be returning from the pizza stand when she was forced to squeeze her way past two ZooperStars standing in the tunnel to the left of Section 320. We both enjoyed the chance photo opportunity. Later Harry Canary would sing "Take Me Out To The Ballgame" But, the best was left for last. A very short, stout, "Clammy Sosa" came waddling out behind home plate in the 8th inning. He immediately starting slamming a CSC Security Employee in the Yellow Jackets that ring the field between innings. Continuing to harass the security guard, "Clammy Sosa" took off, running right toward the guy, AND PROCEEDED TO GOBBLE HIM DOWN HIS VERY LARGE MOUTH! The CSC Security Guard was last seen legs wildly kicking before disappearing down his trap. Absolutely unexpected and hilarious. Everyone enjoyed the moment. The Game itself DID NOT MATTER TODAY, nor the outcome. But, the long, unusually cold winter, is now behind us. Section 320 is back and all our friends are settling in for another season of baseball fun. As The African Queen noted, during the mid-point of today's game. We my not have seen "The Noise Boys" all winter long, but we were all already completing each others sentences and picking up on each others new cheers and chants, like we had planned it all in advance. Family Reunions Can Be Fun! And--By The Way: Walking to The Stadium From Lot 8 today, Sohna and I ran into "SCREECH" at the wheel of this SUV!! I like to know why he had to PAY FOR PARKING?? And--"GRADY" from "Sanford and Son" is back for a third year selling beer on the 3rd base side. We like "GRADY". During the 9th Inning, Mike Cervanek was pinch hitting for Orioles Pitcher, Chad Bradford. Our brand new stadium announcer actually said: "Now Pitching for The Pitcher, Mike Cervanek!!" Everyone in Section 320 laughed. Someone saying the new announcer commented the same way earlier in the 7th inning, during another pinch hit situation. Interesting. Finally, on the main Video Board in Right Centerfield, where the players pictures are put up on the monitor while batting, this years video photos have a grey/metallic and white light backdrop. They are very hard to see. Every single one of them looks out of focus because of the background colors. 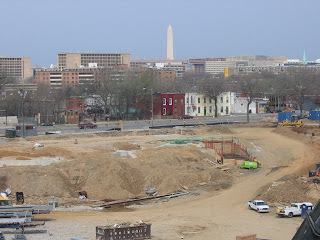 For some time now, I have feared that The New Nationals Park rising on South Capitol Street would be similar to many new stadiums built over the years. 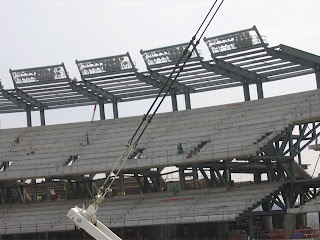 Instead of being intimate, with fans sitting right down in front and over top the field, like RFK Stadium, the new ballpark would push fans farther away from the action. And, the higher a fan sits, the players look more like ants in newer stadiums. You might as well watch the game on TV. Take a look at FedEx Field in Landover. 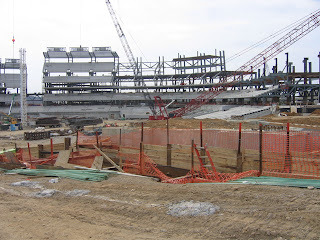 The very first row of the top tier of The Redskins Stadium is farther away than the last rows of RFK Stadium's Upper Reaches. Nothing stood out more at New Nationals Park, during my private tour this past Tuesday, than the closeness of the seats to the playing field. 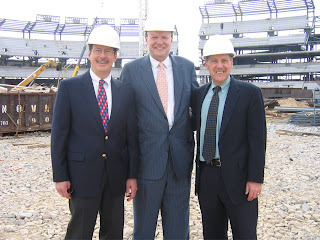 In fact, while Andy, SenatorNat and I stood on the main concourse surrounding the lower bowl, we determined that the very last row in front of that concourse is CLOSER than where we sit at RFK STADIUM in Section 320 (We are 25 rows from the field at RFK). Even more impressive were the seats on the UPPER CONCOURSE. Just a fabulous view--looking right out over top of the field. 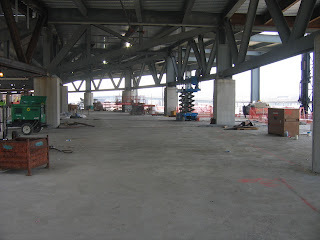 The Upper Concourse Seats sit like a giant high chair back, and views are nothing short of stunning!! I asked Ronnie Strompf, VP of Clark Construction and Senior Project Superintendent for the Stadium Project, how far was the very last row, high up, behind home plate from the field? "About 130 Feet, somewhere in that neighborhood. (How does that compare to RFK Stadium--SBF?) About 300 Feet for RFK. More than twice the distance. This is for baseball only. You could fit this new ballpark inside RFK Stadium. This stadium is very compact. It’s a nice layout, architecturally its going to be very pleasing. This is going to be a loud stadium. The closed in compact design is going to keep the fans upclose. Its going to be exciting. I know it." Ronnie is the point man for the Stadium Construction Project. He arrives on site each morning at 5:15AM, many days not leaving until 7:30PM. 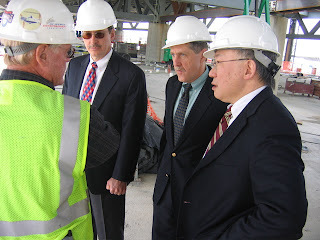 And, DC Sports and Entertainment Executive Director, Allen Lew, would not have taken on the ballpark project happily, if Ronnie was not working with him. "I trust him to get the job done. 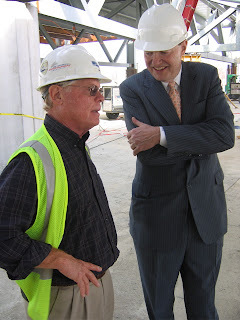 He has a great attention to detail," said Lew. 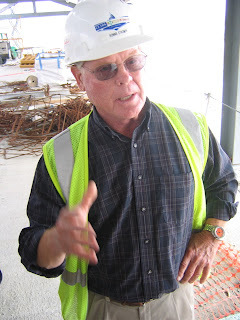 "I wanted Ronnie, so Clark (Construction) took him off another job. He made sure we got done on time at The Convention Center. I have confidence in him. A great guy. 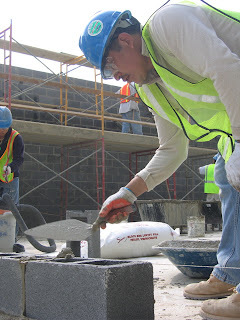 It’s hard, a demanding project, you have to be able to trust the guys that work for you. If not, nothing gets done properly." 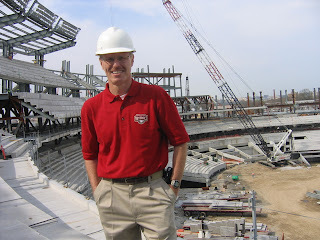 Any question I asked on the 41,000 Seat Ballpark, Strompf had the answer. "The structure is laid out this way," Ronnie said. " Lower Bowl, with the majority of the seats (22,000). 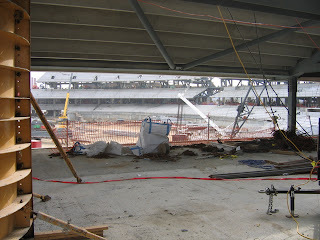 The first section overhanging the main concourse is club level. 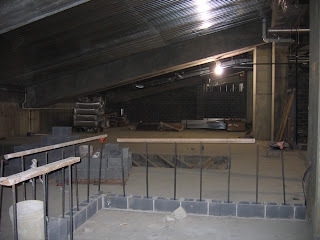 The section above that, with a real thin band between levels is also club, but called suite level. The next section, the open area between the high and low pre-caste levels—that’s the Upper Concourse, lower seating and higher seating (12,100 total seats). So, you have 5 levels total, and The Press Box on top of the back lip of the Upper Deck. 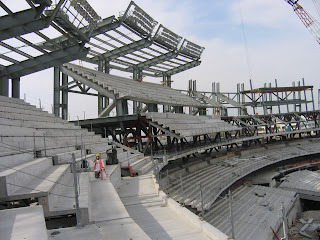 The highest section of the stadium goes from first base to third base. 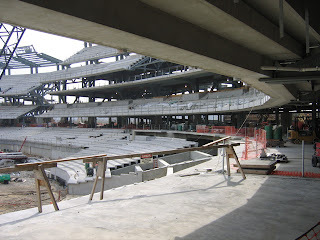 But, the Upper Concourse does have two sets of seating, lower concourse seating and Upper Concourse Seating. In dead centerfield will be a restaurant with graded seating in front for patrons of the restaurant. All your high structures from the infield from 1st to 3rd, on the second and third tier, is where all your money generating suites are. They will be very well appointed. Sliding widows, all the amenities and an open air feeling. People are going to like those seats." 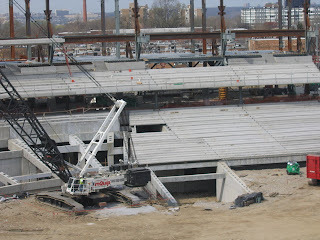 Currently the lower bowls permanent concrete seating structures are in place. So I asked how many rows will be added in front of those contrete settings? “Those are the ongrade seating structures, about 10 rows. 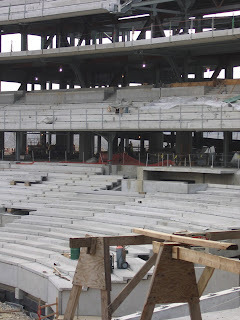 Those seats will be added, but they are not structural pre-caste like the majority of the seating areas in the main bowl. 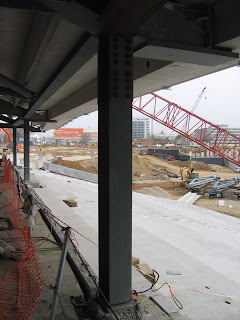 Everything in front of the concrete pre-caste onward to 70 feet is slope fill and on grade seating there. 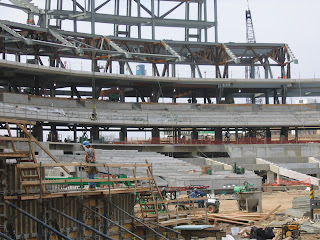 About 3/4th of the seats in the stadium, fans will enter from the concourse level and walk down. That will allow for people to move in and exit really quick. It’s a really neat setup." 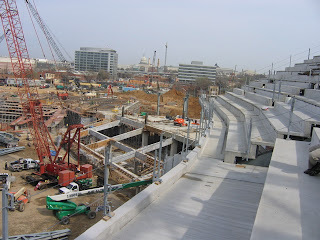 Since the slope grade seating is not pre-caste, is it possible they will shake allowing fans to jump up and down like on the 3rd base side at RFK Stadium's lower level? If I am at Citizens Bank Park in Philadelphia and standing on their main concourse, buying something from a vendor, I can still watch the game clearly due to the openness of the park. Will that be the same here on South Capitol Street? “We will have the exact same thing here. 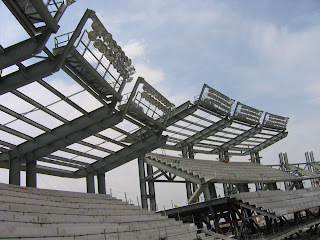 And, you will be able to eat your meal, while standing at a waist high table directly behind the last row of the main bowl seats, and still watch the game.” (Sohna and I experienced this at Citizens Bank Park and we felt it was one of most fan friendly amenities of that stadum-SBF) “Stainless Steel Stand Up Tables, they will be well used." The Main Concourse is WIDE, not like the thin narrow bands at RFK STADIUM. 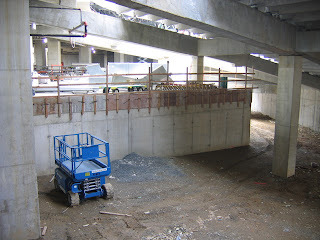 On the outer rims of the concourse the food stalls, memorabilia shops and bathrooms are being placed. Portable food carts will ring the inside of the concourse behind the last row of the lower bowl and the Stand Up Waist High Tables. But, just to be sure, I asked Ronnie whether the food offerings for the average fan that loves baseball will be affordable? "Those fans will have the same opportunities as any other person that walks into this stadium. You still have to pay for your own hotdog. And it probably won’t cost as much, for sure (everyone laughing). The restaurant out here (in centerfield) will most likely carry many of the same fare as you can find anywhere else (in the stadium). Every fan will have ample opportunity to enjoy themselves in many different ways here." Philip Artin, Allen Lew's assistant from the DCSEC jumped in to comment: "The average fan will be more comfortable, if not as comfortable as the high end fans. This stadium will have a lot to offer. This stadium is going to be very intimate, very nice. Fans are going to enjoy coming here. We visited almost every single stadium (in MLB). 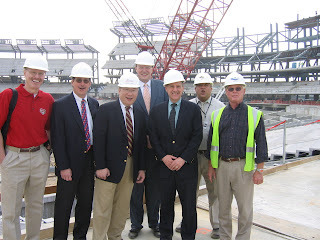 The Architect and Allen’s Team visited virtually every stadium that was built in the past 10 years. So, we have picked up all the best elements from those. AT&T Park in San Franciso and Kauffman Stadium in Kansas City were two that we pulled a lot of ideas from. Both of those stadiums were built by the same architect (HOK). Just like in San Francisco, or Philadelphia—you can do the same thing here, while standing in line for food, hot dog or a beer. You can watch the game, easily. You will not miss anything." In the main bowl of the stadium, the lighting towers are already in place. 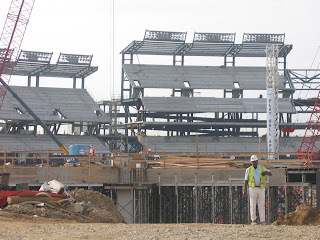 And, showing how advanced construction, just like everything in life, has become easier due to computers, Ronnie talked about the Stadium Lighting Grid. "All the lights on the stadium are pre-programmed by a computer to shine down in certain definitive spots. There should be no adjusting of any of the lights once they are set in place on the stantions. 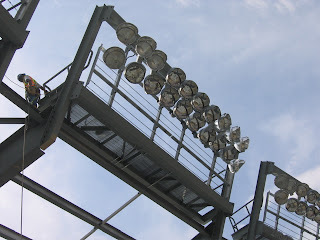 Each goes to a specific spot in the stadium, from its individual light tower. I have a $20 Bet with my electrician that something will have to be adjusted, but he assures me that will not be the case. We shall see." SBF—So right now, as we look at the light already in place. They will never have to be adjusted? “That is correct. Everything we do now is done by these computer models that actually are rendered in 3D. Its called an “X” Model. All the details and configurations are laid into this model. The Programmers can make the final outcome anyway you want it. Then, once everyone agrees on the dimensions, then the programmer just presses a button and all the drawings start coming out from that. Whether it’s the lights, the Steel Work, the concrete placements, its all preprogrammed. We take those printouts and go from there. There is no guess work. It is a very, very reliable and excellent program. There has been virtually no adjustment with the steel work. They (the computer programmers) did an great job with it." (Because of the computer printouts, has that made the tight production schedule more manageable?-SBF) "Even with our very ambitious schedule here, we have been able to meet every schedule step without any problems at all. " Ronnie continued: "These light towers come all the way to the end of each wing of the stadium. 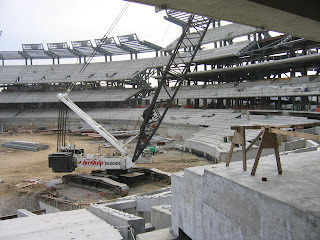 And, one light tower each will be placed in Right and Left Field. Right now, the concept of lighting is to minimize residual light into the neighborhood. So, everything is cast down. You are really not going to see nothing but a lite glow from outside the park. Beyond the stadium, you will not be able to see the light projecting out. The architects made the effort to take in the effect on the residential and business neighborhoods in the area. When they designed it. Its going to look really nice, the light will project out through the stadiums openness." 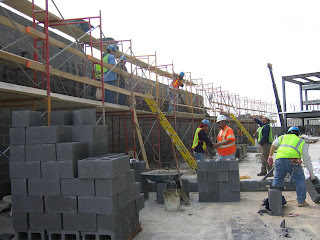 "There are 400 workers here now, which consists of the major trade construction group. That includes your concrete, foundation, steel, electrical, plumbing and sprinkler on the job. We have Masons now. As we get more linear footage out here (to work), then we will be adding to each crew, on a neighborhood of 25 guys per group. Then, we bring on the DryWall Guys. We actually started the painting crew today. So, we have washed down all the steel, to start painting. Then we shall add all the misc. metals. (Once the steel and concrete is all in place the detail work will begin. 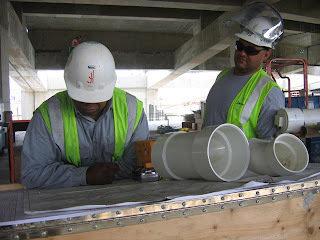 1000 trade construction workers will be on site, each and every day, until ballpark conclusion--SBF). 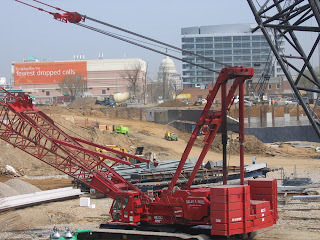 What's sort of funny about the Stadium Site, is that there is a concrete company, scheduled to move off the premises of Potomac Ave, SE, directly behind the South Side of Nationals Park. So I asked Ronnie: Everyone is curious to know whether you are getting your concrete from across the street (Everyone laughs)? As we walked around the park, you can, right now, see The Capitol Building clearly from the lower bowl on the third base side of the ballpark. Although, once the Four Story Parking Structures are built in right and left field, along with the Near SE buildout, that view most likely will disappear. But, from the Upper Deck, The Washington Monument can be seen by nearly everyone from their seats, and even from those that sit in the back half of the lower first base side. SenatorNat estimates that 2/3rd of the seats at Nationals Ballpark will see some portion of The Washington Monument. That's Nice Folks, anyway you cut it. But, it still begged the question, whether after all the build out on the Anacostia Waterfront happens, do you anticipate any views of The Capitol remaining? After heading to the Upper Concourse to take in the fine views, we headed down into the underground sections of the ballpark. This included the Nationals Locker Room. 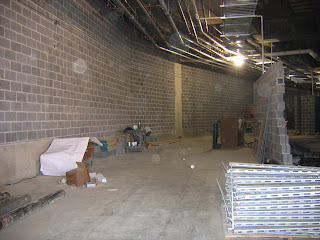 The Nats Clubhouse sits directly under the first base stands, with a slanted ceiling. Ronnie informed me that 6" batt insulation will dull, but not take away, the noise and pounding of the fans sitting above. Included in the home clubhouse, is a special indoor batting cage, with Glass Viewing Portal, for Diamond Club Members. Right now, you can't get a good idea of what it will be like from this picture. 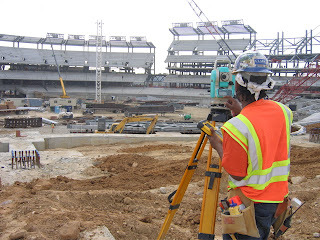 But, I have asked to return at certain major points in construction to take like pictures from the same vantage points. The Time Lapse will be quite revealing, and fun. 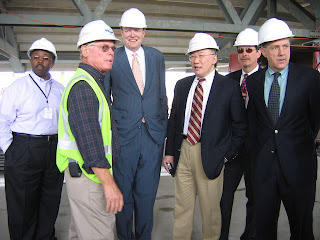 Having seen The Nationals New Ballpark slowly rising on South Capitol Street, I still didn't really know what to expect when I was given the wonderful opportunity, courtesy of Bill Hall (Partner in the law firm "Winston & Strawn"), to make a private tour of the construction site. 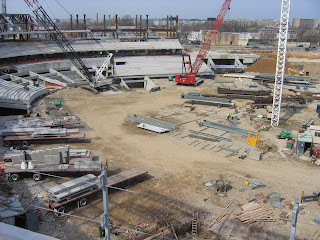 Many times, I have stated my love of RFK Stadium, but after spending two hours on site personally seeing the new stadium coming to life, I am quite thriled. 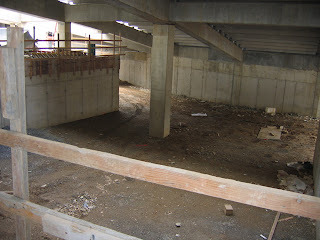 The compact, intimate nature of the New Nationals Ballpark was exciting to see. 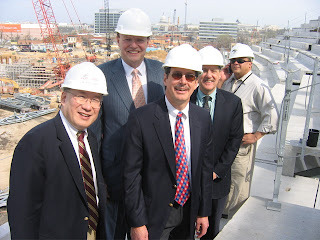 If, through all miracles, Allen Lew, Ronnie Strompf and a host of others pull off a Limestone Looking, Glass Gleaming, Bright Shining New Signature Fixture for Our Washington Nationals and our City--Washington, DC, being a Baseball Fan in The Nation's Capital will be ONE FABULOUS EXPERIENCE!! Will Our Nats Extend Their Hand? Yeah, I Know--But Its Baseball! !